Fine, sunny weather welcomed the start of the third day of digging. After the retreat of a herd of friendly cows, who found Trench 2 very interesting, work on the site could begin. The loose stones were removed from the east of the trench, revealing yellow clay reinforced with stones. 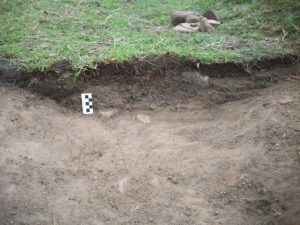 The area exposed was 35cm wide by 175cm long, along the northern side of the trench. Was this the base of a wall, reinforcement for the bank side or even the base of a firing step used during 1WW trench training? 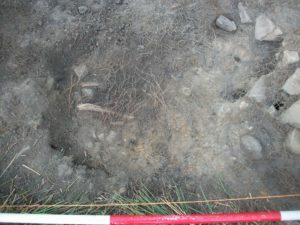 Underneath a layer of decomposed plant material, a cobbled layer was found in the south eastern side of the trench. Pieces of wood could be seen on top of the cobbles. 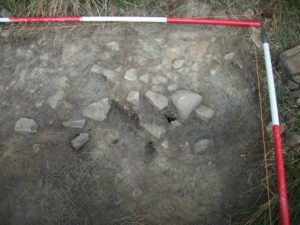 Excavation of the cobbled layer and the stone feature will continue. A metal detectorist Neal Cowgill surveyed the site. He found 700g of assorted cartridges a mortar tail and other metal objects. He found the cartridge cases clustered around the wall and the sandstone quarry at the top of the hill. He checked the trenches and found a horseshoe just beyond the eastern edge of Trench 1 situated at the bottom of the topsoil. Coins were found in the field ranging in date from modern £1 coins, a 1950 farthing, Victorian and Georgian coins. A possible Georgian buckle was also found.